Of the many people who I enjoy spending time in the outdoors with, this old girl has to be my favourite companion. Her name is Bear (very fitting as she is almost as big as one). She keeps me company, alerts me of other animals (potential food) , and provides a type of entertainment that no human could offer. It’s truly a pleasure to spend a day in the backcountry with someone who enjoys it as much as you. Being a husky/malamute/mutt mix from Labrador, Bear is pre-wired to thoroughly enjoy being outside and surrounded by woods, especially when it is frigidly cold. I realized this immediately during our first winter trip. 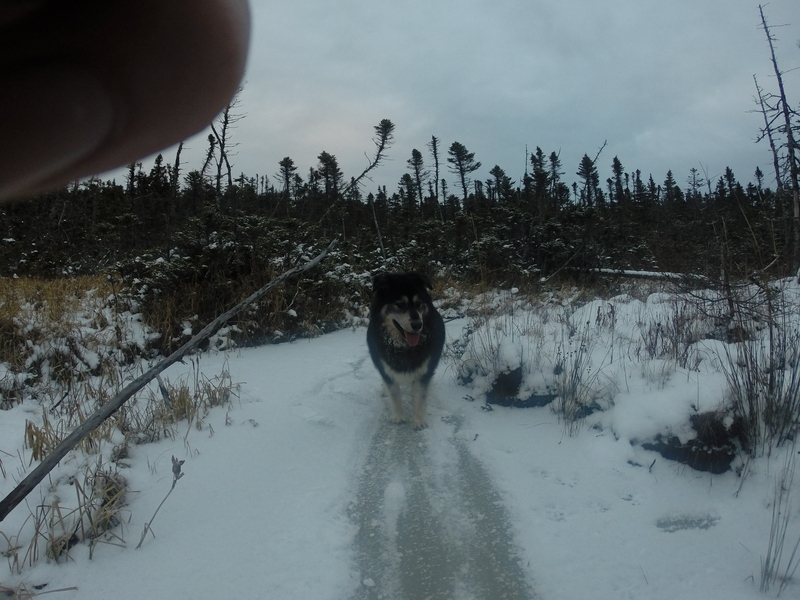 All she wanted to do was go into the deepest snow, in the thickest woods, and get the furthest off the trail she possibly could while still seeing me. Pure excitement. She also loves the extreme cold because it relieves her of the warmth felt when she is in the house. A dog with that much thick fur is at mercy when they are immersed in room temperatures for too long. At least I can say I’m able to let her off the leash and not worry about her running away. She is very good in that department. But, trained well you ask? No, not quite. I would say she is halfway there. Not bad for a 1 and 3/4 year old. She does perform in some categories rather good. Like staying close to me in the woods, coming back when I whistle, and sitting nicely while we drive. I also have no problem seeing her paw when a treat is handy, but wouldn’t you do the same, if an enormous sized individual was offering you a large, delicious snack? Makes you wonder. One area she can improve on though is coming to call when other animals are around and she is off her leash. She will look back at me in this situation, but she cannot be trusted. Her desire to play and investigate the situation takes over and she is gone like the bat out of hell. It’s usually not a big issue, but bear is a big dog and likes to play rough. I would not want her jumping on a smaller dog in attempt to play but instead causing harm to someone else’s pet. For now she will stay on a leash in public areas. One trait we definitely have in common is our appreciation for being in virgin territory. The sense of curiosity we feel as we approach a new area or round a new corner drives us in our quest to explore. Bear usually leads the way during our walks. Sometimes I need to remind her not to go to far. She is just that excited to see what lies ahead. Like her, I too feel that excitement and enjoy stomping my feet in new and uncharted grounds. Some may just be new to me, while other areas could be the freshest of earth. 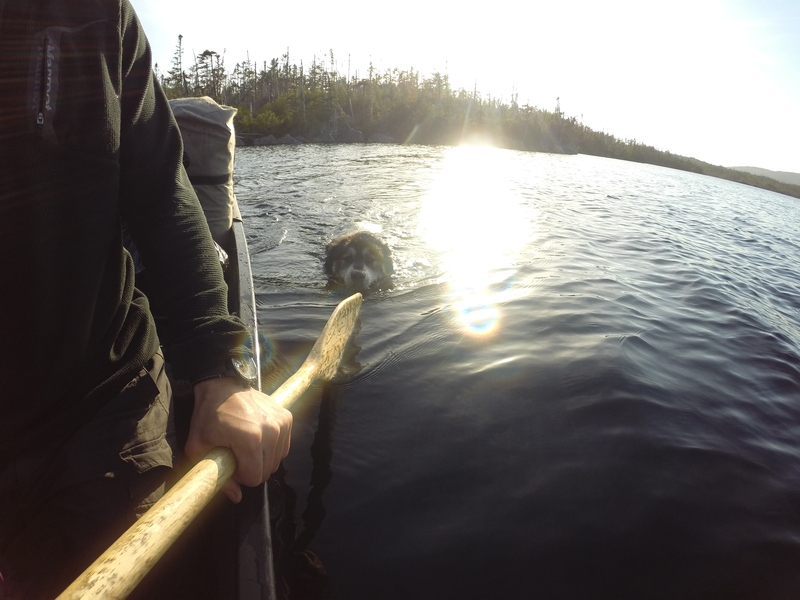 One thing I remember fondly from our adventures is Bear’s first swim. This was something that my girlfriend Heather (owner of the dog), happened to miss out on. I continue to this day to rub it into her, that I witnessed her precious baby’s first dip. It all went down near a small gully. Bear left a little landing of thick grass and made her way onto a mossy patch that looked like solid ground but was actually floating in the water (she did not know this). As she made her way onto it she sank into the water and was on her way. The first thing in her sight was a large boulder. She frantically climbed it like a polar bear grappling an ice berg. Once she was there she did not know what to do. I was laughing out loud to myself in the middle of the bush! Her only way back to safety was to swim again. She contemplated it for some time but after some persistent work I convinced her to come for a treat. So she swam again and that is the story of her first encounter with the drink. Now it is her favourite outdoor activity and I have a hard time getting her out. Especially on warm summer days when it refreshes her thick coat of fur like no other. Like us, no dog is perfect. She will make mistakes to learn, and grow along the way. Bear has a passion for exploring. Hopefully that way includes many more adventures into the great outdoors. One passion we both have in common. ← Welcome to NL Explorer’s Site!